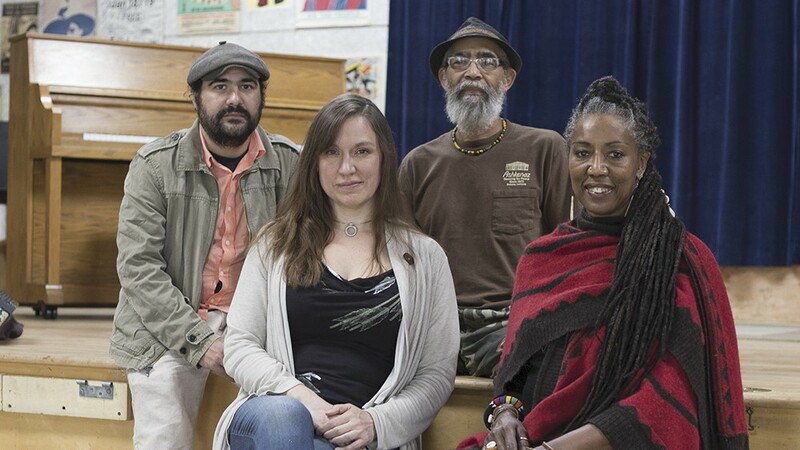 (Left to right): Max Lopez, Brandi Brandes, Larry Chin, and Mahealani Uchiyama are continuing Ashkenaz’s mission in a new light. Born in Korea and raised in Seattle, violinist-looper and vocalist Joe Kye draws upon his migrant upbringing and blends indie rock, jazz, classical, pop, and world folk to create a unique sound. Joseph's Bones is an instrumental, trombone reggae band that performs classical compositions by drummer-composer Jason Levis along with arrangements of reggae hits by the likes of Bob Marley, Augustus Pablo, and Burning Spear. On Friday, May 18, Kye will join Joseph's Bones at Berkeley's Ashkenaz (1317 San Pablo Ave.) to reveal their most recent collaboration. This may, at first, not strike you as odd. But consider this: two classically trained musicians coming together to create live acoustic dub music in real time. The possibilities of that sound almost defy categorization, and defying categorization and convention seems to be Ashkenaz's new mission. "Joe Kye and Jason Levis are both very consummate musicians who are doing something completely unusual," said Brandi Brandes, Ashkenaz's executive director. "They're taking a different tact with their training. The through line there, for me, is their level of musicianship and the way they're using it to express two different things, [jazz and reggae]. It was an unexpected through line, which is more of what I would like to do." With the changing demographics of the Bay Area, and Berkeley in particular, Brandes, who has been at the helm of Ashkenaz since 2015, has begun to transform the venue to reflect those changes with more experimental hybrids and community-focused programming. Not everyone is happy about that. "The response we're getting is very mixed," Brandes said. "We try to build bookings based on these through lines, but sometimes the outcome is so different that people in the room don't understand. My goal is to get people in the room together, both onstage and in the audience. Sometimes, it's hard. More often than not, there is appreciation and curiosity. Once in a while, it falls flat on its face." Founded in 1973 by David Nadel, a Berkeley activist who championed the preservation of People's Park and was involved in the international folk dance community, Ashkenaz quickly became the gathering place for Berkeley's world music scene and established a reputation for "traditional" and "ethnic" musical gatherings that they're still known for today. Nadel operated Ashkenaz for more than two decades with international folk music, jazz, and punk rock. He named the club in honor of his Jewish Eastern European roots; the front of the building is designed to resemble an Ashkenazi synagogue. Now, more than 20 years after Nadel's time, the concepts of "traditional" and "ethnic" are being held in a new light. "The challenge with Ashkenaz in 2018 has been the question of what interculturalism is," Brandes said. "When the concept of a melting pot is put into practice, it can look a whole lot like cultural appropriation and whitewashing. What does respectful intercultural exchange and understanding look like?" For Brandes, this means utilizing the space in innovative — and sometimes urgent — ways. On April 29, Ashkenaz presented the first in an open forum series, "Talking About Racism: Unmasking the Elephant in the Room." (It continues Aug. 26, Oct. 28, and Dec. 30.) The April forum was only the second time that the dance and performance space presented opportunities for the community to engage with one another on pressing, contemporary social issues. The first was last year's series of workshops on bystander intervention to address the rise in violence against marginalized people in the age of Trump. "The bystander intervention workshop gave people the opportunity to role-play certain situations, like what to do when you see somebody screaming at a woman wearing a hijab on BART," Brandes said. "I expected people to come in acting like they were heroes in pretend situations, but even in the role-play, people got scared. You could see people struggling to get past their fear and act. That's when I realized the important work our safe space could provide by getting different types of people together in uncomfortable situations. It's the only way to move forward to try and understand the world around us." While her approach seems innovative and sincere, it has also been seen as too non-traditional for some of Ashkenaz's regular patrons. There has been an unexpected culture clash coming from unpredictable segments of the population. Some regulars to the space have sent Brandes emails accusing her of "politically correct multiculturalism" or "virtue signaling," while many newcomers take issue with what Ashkenaz has traditionally been. Ashkenaz, for example, had a self-defense workshop in 2017, where Brandes chose a Black man who was a martial arts expert and social worker to be the instructor. During the first moments of the training, a white patron approached him and said, "I'm so scared of you right now. I came to this workshop to deal with my fear of Black men." "I was devastated," Brandes said, "but I realized that this is something we have to do to continue the process." And this process, as necessary as it is for the community and country, brings both the curious and conflicted through the doors. Culture clash is not only expected, but often encouraged. Then, there are other times when misunderstandings of Ashkenaz's history and purpose can take a heavy toll. "This guy came in, a local teacher, and was shocked and appalled to see kids had fallen asleep on a pile of coats," Brandes said. "The staff is used to having kids running around — I've been letting my kid run around in here since she was two. The doormen and security guard are always there.... There's no way to change some people's perception. If I or the staff saw anything egregious taking place, we'd act on it." Brandes pointed to Ashkenaz's track record of action. A doorman recently tackled a stalker who was harassing a woman. And, in 1996, founder Nadel ejected a drunk patron. That patron returned and shot Nadel in the head. He died two days later. The community responded by forming a tax-exempt nonprofit arts organization, today's Ashkenaz, to buy the building and continue Nadel's important cultural work. Maybe because Ashkenaz has been around for 45 years, it's easy to forget that this Berkeley fixture, with a history that reflects both transition and tradition, can still be innovative and remain relevant even as the community changes. In these violent and confusing times, it can, as long as the space changes as the audience does. "I think when I started making choices to diversify the staff or the board and the offerings on stage, based on a broader representation of ethnicity and age, some people got mad," Brandes said. "It was like, 'You're not picking the best person for the job. You're picking people based on the color of their skin, that's racism.' Some people are really struggling with that.